We are passionate about following Jesus at all ages and stages at College Park Covenant. In this last year, we have articulated our 5 values when it comes to walking alongside children in becoming and growing as disciples of Jesus Christ. Check out our 5 values below, or download the PDF! We create a safe and fun environment for children to grow in their love for Jesus and feel cared for by the church. We have amazing volunteers working with our children. They are creative, loving, competent and love to teach kids about Jesus. Each volunteer is screened through our 'Plan to Protect' program, has done a police check and works by a Code of Conduct developed to keep kids and adults safe and healthy together. 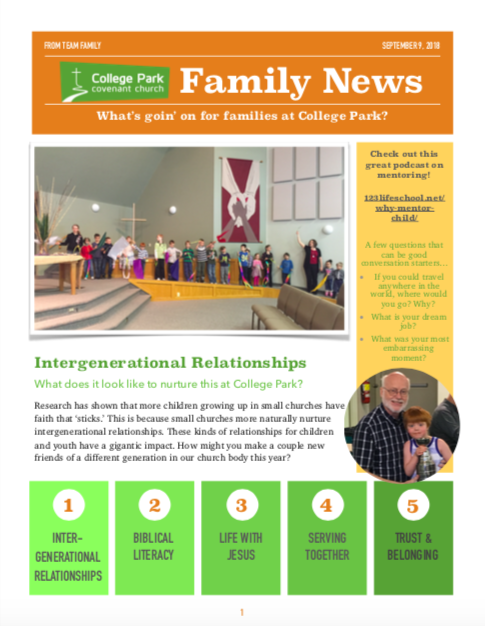 Check out the first edition of the Team Family Newsletter! Our Nursery is on the same floor where the worship service is happening. Volunteers will play with, read stories to, do simple age-appropriate crafts and make space for play with plenty of toys. A simple snack is served. Nursery childcare is available year round. Each child is signed in with a name tag with information about food allergies, bathroom needs, etc. Each child is released at the end of the service to a parent with the tag that matches his/her name tag. Parents can be contacted during the service via text message. Our Junior Church kids worship in the service for the first half hour or so and then are released to the classrooms and large room downstairs for the remainder of the service. Junior Church is currently divided into two age groups: 4 to 6 years old and 7 to 9 years old. Occasionally the groups will do activities together. Curriculum, craft activities, drama, music, cooking and special projects vary for each group. Volunteers teach one class for a month at a time so children and adults get to know each other well. During July and August kids remain in the service to practice participating in prayer time and listening to the pastors' Bible teaching, plus we have colouring sheets and activities available, too. • When children form Inter-generational faith relationships, they have a solid base to continue a strong relationship with God and connection with the wider Church as they become young adults. • This is what makes a small church community so strong! We want to live into our strength. • We can foster intergenerational relationships through mentoring, social events, serving alongside each other, and being intentional about learning from one another. • A hearty appetite for God’s word and a growing understanding of how to read it and be shaped by it is what we desire for our adults and children alike. • We recognize the beauty and significance of the overarching story of God through the bible and we are invited to find ourselves inside that same story. • We long for the Holy Spirit to transform us through what we digest in God’s word. We want to be changed by God’s Big Story. • We believe that an ongoing, personal encounter with the Living God is the highlight of our existence. This is our number one hope for the children and adults in our lives. • Knowing the bible and knowing about God is not the same as knowing and being known by God. We will always look for opportunity to introduce and foster personal relationship with Jesus. • Every single person is capable of hearing Jesus’ voice and Jesus desires to speak to each of us. We trust him to teach, guide and love each of us well. • When we reach out to do something for someone else, we act as God's hands in our world. We believe serving is part of God’s design for developing and maturing us, no matter what age we are. • When we serve together - adults and children, we learn from and inspire one another. We discover who we are and what we can do. We also deepen our dependence and trust for each other. • Serving together keeps us in tune with the heart of God because God’s heart is close to the broken, hurting and needing people and places of the world. • It matters deeply to us that each child and adult experiences safety in the life of our church body. We pursue this through kindness, sensitivity, and appropriate screening and preparation for volunteers. • Trust and belonging develops through respect, dignity and particularization. This means that each person is considered unique, loved, and is seen for who they are in God’s eyes. • We plant seeds of love and belonging now, recognizing that the harvest may be for a later season in life. In bringing your child to the community of faith to be either baptized or dedicated, you are acknowledging your desire and the child’s need for the gathered church to help children come to faith and to grow in faith throughout their lives. Baptism and dedication are similar, but not the same. Baptism is a sacrament that looks forward to God’s searching, seeking and finding us. Dedication is a practice developed in relation to believer baptism and points to the parent’s commitment to raise their child in a way that teaches of God’s love. When parents bring their child for baptism, they acknowledge in the sacrament, God’s promise and the unmerited gift of God’s redeeming grace. Its emphasis is not on our response, but on what God has already graciously done for us through Jesus Christ. Parents who dedicate their child look forward to the day when the child hears, believes, and is baptized. The believer who is baptized makes public, through immersion or sprinkling, the witness to this conversion and a pledge of personal discipleship. The focus here is more on the believer’s conscious reception of God’s grace. At College Park we celebrate the historic diversity of the body of Christ and recognize both practices in our community. For more information you can read the Covenant’s statement on baptism here. Every few years we offer Confirmation, an opportunity for teens to dig deeper into God's Word and grow in their life-long journey as Jesus’ disciple. Using the ECC’s own "The Journey" curriculum, students learn the foundational beliefs of Christian faith, the story of the Bible, and growing pains of the Church throughout history. During the two year journey, students spend time working through their journals, reflecting on their learning, and coming together to dive deeper into God’s word. After students have completed the process, they will be given the opportunity to participate in Confirmation Sunday—a day where we celebrate and affirm their accomplishment.